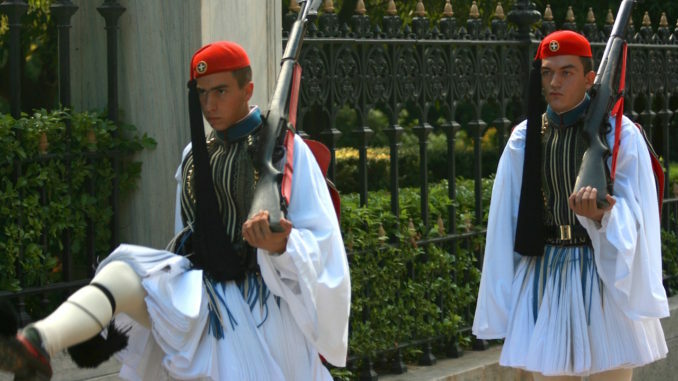 When you visit Athens, one of the things that should be on your plans is to see the Athens Changing of the Guard. Time your visit just as the ceremony is to begin because it is along and elaborate show. You can watch the new guards march on. They will be inspected before the old guard is dismissed to march off. The outfits are ceremonial with the large wooden clogs with pom moms. The guards will delight you with a show as they high kick their steps and clack their heels. We have seen the changing of the guard in Ottawa, Canada and in London, England. But this was a fun show and not to be missed when you visit Athens! Did you see the Athens Changing of the Guard? What was your favourite part?